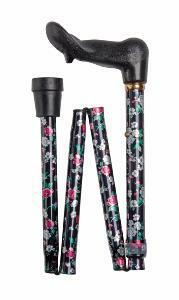 A very pretty folding stick available in left and right-handed models. The textured, black, orthopaedic handle spreads the user's weight over their palm and provides excellent support. Many sufferers of hand conditions such as arthritis and rheumatism find this handle shape easier and more comfortable to grasp than a standard walking stick handle. The floral print features a black background with pink and white roses and green leaves. The folding cane is adjustable in height between 80cm-90cm (approximately 31.5"-35.5") and is fitted with a black non-slip rubber ferrule. Ferrule diameter 19mm.